I’m 35, married for 15 years, two daughters (13 and 8) and a dog. Ohhhh. What do I do? I’m an artist, I design gift product, paint canvas, create, explore… get distracted! And, I’m a business owner, I manage four employees, cast vision, organize, do wholesale shows, analyze inventory, pay bills and whatever else needs to be done. I am curious about how you started your business . How did that start and are you surprised at how successful it has become. About 15 years ago I decided to go back to school for graphic design. I registered, went to my first day of classes and headed over to the college bookstore. When I was there I saw this amazing book on taking recycled picture frames and turning them into colorful artwork. We were so broke at the time I left that book behind and drove 30 minutes home only with the required books. I couldn’t get that colorful, creative book out of my mind. I finally got back in my car and drove back to the college, dropped the classes, returned the books and bought my “new college class”! I got home and my husband drove me to Home Depot, helped me buy a scroll saw, set it up and showed me how to work it. From there I began making all kinds of misc. 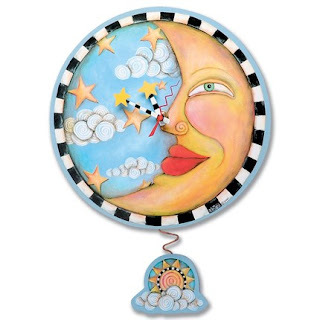 things-wall plaques, key holders, greeting cards, clocks, magnets. One thing led to another. Am I surprised? Yes! I never wanted to be an artist. I watched my mom struggle as an artist all my growing up years. It definitely wasn’t on the top of my “to do” list! I see that you travel to China for your work. How many times a year do you go and what exactly happens in China? I go twice a year. The wholesale markets are in the Winter-Jan.& Feb. and Summer-June & July so I go and develop the new lines for each season. I have posted on my blog the past two trips to China and all that goes on while I’m there if you would like to see more detail. You are a very talented artist, how does it feel to be able to do what you love for a living. It’s a huge blessing! I can’t imagine doing anything else. My heart aches for people who have to work day in and day out at jobs they don’t enjoy or have a passion for. I have much to be thankful for. I see that your mom has a blog and that she is also a very talented woman. How has she influenced your art and business? She’s been a huge inspiration to me in so many ways. When I was young she taught me to draw and to “see”. She’s a hard worker and a problem solver and has modeled that for me my whole life. Like I said earlier I watched my mom struggle as an artist when I was young but she never gave up. Now she’s published and making a living as an artist/author. And, she has always been my #1 cheerleader! When did you realize that you were a creative soul? And what was the first thing that you created? I probably started feeling most creative in middle school when I would draw with blue Bic pens tattoos all over my friends arms. Now, having a middle schooler myself, I’m sure their parents were also embracing my creativity! Color and patterns of any sort inspire me. Of late I’ve been spending a lot of time paying attention to things in nature. 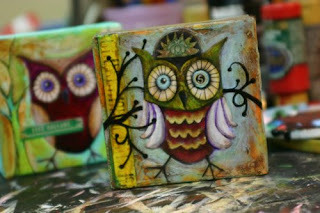 I am a blog addict so seeing what others are creating makes me want to get my brushes gooey! Do you have a studio in your home or is everything offsite? We have 3.5 acres which include our home, a studio where our US made line is produced and everything is shipped out of and a larger shop that houses warehouse space, a woodshop and a smaller studio where I work and Katy my graphics gal works. You have two daughters, is it hard to manage motherhood, work, and travel? As a mother I am always curious to see how other women deal with these issues. It was a lot harder when they were younger and crying every time I left for shows or China. The loads of guilt were heavy! I had to always remind myself that when I’m home – I’m home! Now they’re used to the schedule and they always know where to find me. It will be interesting to see what they say about their mom working when they grow up. I’m sure they’ll be in counseling for something! Lol! Michelle, I have to say that when ever I read your blog I get such a good feeling. You give off such an amazingly kind energy with your words, pictures and art. It is no wonder that you are such a success as an artist, business woman and a person. Another fabulous interview and interesting person to learn more about...how are you doing? I enjoyed that, thank you. I love to discover new artists and their blogs.